3 classic TREEHOUSE OF HORROR episodes on the big screen! After 23 years of Halloween themed-episodes — the most recent one aired earlier this month — Bart, Marge, Kang, Kodos and the rest of the “ghoulish” Groening gang have given us plenty of options from which to choose. Of course, the easiest thing to do is simply view the first five or six “Treehouse of Horrors” in a row since those are clearly the best ones. But I believe it’s possible to mix it up a bit more to come up with eight devilishly d’oh-y installments that make the perfect complement to a night of jack-o’ lantern carving or, if you’ve lost power courtesy of Sandy, to watch on a battery/generator-powered DVD player. I’d forgo the crap from Season 20, which the article tactfully calls “a bit uneven”, but they don’t have a terrible list there (even if it does incomprehensibly not include “Treehouse of Horror II”). There are some good additions in there, “Bart Sells His Soul”, “Cape Feare” and “The Springfield Files” especially have some creepy, Halloween-esque elements to them. “Starship Poopers” from Season 10 which contains “I absolutely refuse to go along with this, but since I have no choice, I’ll take the alley”. I’ve always thought that was a very subtle abortion joke, and those are damn near impossible to sneak onto American television. “Desperately Xeeking Xena” from Season 11, which gave us “a wizard did it” and “best death ever”. And even “Night of the Dolphin” from Season 12, which has “alcohol and night swimming” as well as “we’re all frightened and horny”, and it uses “glory hole” on network television, another one of those things the censors are too square to possibly catch. Come dressed up … perhaps as popular cartoon characters! Just for the sake of a change, “Treehouse of Horror XVI” from the Zombie era isn’t that painful to watch, for once. “Time and Punishment” is so great. They jam in so many jokes in eight and half minutes. Nah, XVI had the deplorable costume/Dennis Rodman segment, and the robot taking over the family one. One of the very worst. Those are good classic era picks though. IMO whatever specials precede it and whatever succeed it are even worse. Like I said, XVI is one of those specials I “could” watch again sometime. Unlike the one they showed three weeks ago. actually! Keep up the good work btw. My favourite gag in Starship Poopers is Marge’s non-answer to Homer’s “Was he better than me?”, which is twice as funny if you remember it when you see Kang blast her for less than a second with his insemination ray. I feel stupid asking this, but how exactly is that an abortion joke? Ever heard of dumpster babies? It’s one of those things that I’m not 100% sure is a joke, except that if it isn’t a joke it makes no sense. Though most illegal abortions didn’t/don’t take place in alleys, the traditional phrasing for one has always been “back alley abortion”, combine that with Marge saying she has “no choice”, and voila, abortion joke. A woman saying that she has no choice but the alley is about as obvious as you can get. I never thought of this until you mentioned it. If true, it’s very sneaky and subtle. Something Zombie Simpsons could never accomplish. 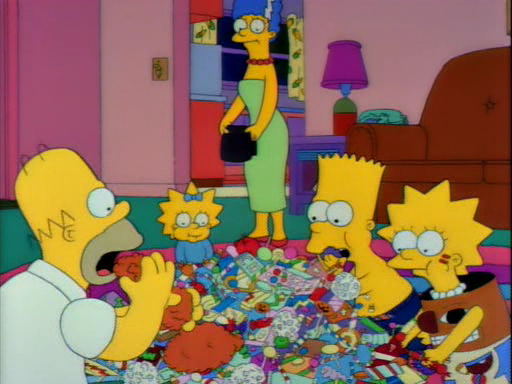 I think Bart Sells His Soul, while having spooky elements, is ultimately too emotional for Halloween viewing. El Viaje Misterioso De Nuestro Homer, that is more psychedelic than truly scary, and even then only for one act; if it had more moments like Homer running around a faceless Marge, it would be a better contender. Surprised ye mentioned a Season 12 episode. It’s a fun little segment tho so you’re justified. The rest of the list I can agree with. Say, did anyone attend the event, and found out what they ended up showing?